It’s still nice and early on day three of our 2016 summer holidays and already we are enjoying our lovely long days. The sun is actually shining for a bit and really I should be sipping my tea outside to soak it up! I’m grabbing a super quick two minutes to do a spot of writing, if I ever want to get back into a proper routine of sharing our days then I really must carve out these tiny moments. It’s hard to find them before my semi-coherent thoughts give way to a jumble of tiredness and zoning out by evening time! My girly and I have enjoyed a couple of slow mornings this week and this fills my heart and soul right up. Quiet chats, hot tea , IG and blog reading with the early morning birdsong filtering in through the open window, mingling with K’s morning tv viewing. I love it. This morning we have an early start (well not as early as intended as my alarm didn’t go off and it was the only alarm in the house that was set!! Oops!) but all of the kiddos have quickly settled into a quiet table top activity and I have used that gift of time to enjoy my cuppa and make a tentative start to my summer blogging. 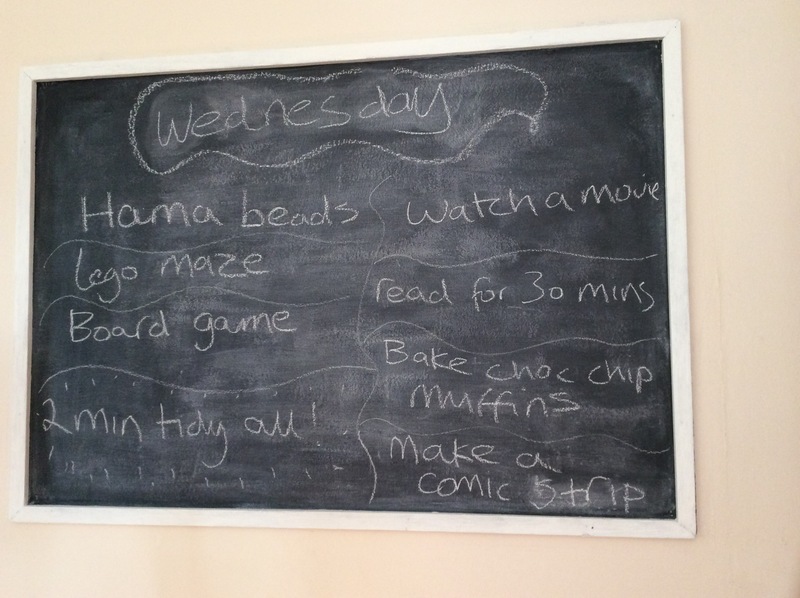 This is our Wednesday battle plan for surviving an 8-5.30 work day filled up with 6 kids ranging from 1yr to 10yrs! We do these every year but it’s usually just for me and my girl as our house is usually otherwise filled with much littler ones who can’t read, so this year I’m excited to see our lists (hopefully) ease us through our day with older children who can read and act on the suggestions! Day 3!! We’ve got this!